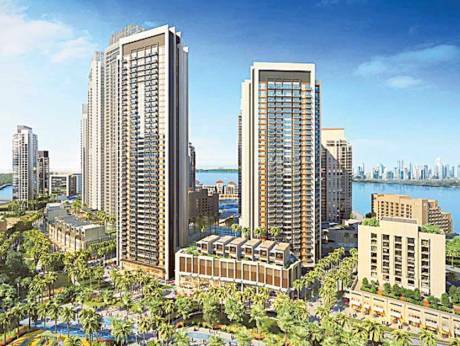 Dubai: Emaar Properties said on Sunday it has launched residences and villa town houses in Dubai Creek Harbour. The sales event will be on a first-come, first-served basis from August 18, at all participating Emaar Sales Centres in Dubai, Emaar said in a statement. Dubai Creek Harbour will feature commercial districts, leisure developments, residential neighbourhoods and parks. The “Creek Horizon” homes are located near The Tower, in the centre of The Island District. The two residential towers, 35 and 41 floors high, overlook the Dubai Creek, the Downtown Dubai skyline, and the Ras Al Khor Wildlife Sanctuary. In addition to the 1-, 2-, and 3-bedroom residences, and 4-bedroom penthouses, Creek Horizon features villa town houses set on a podium that connects the two residential towers. The top of the podium includes a pool, lounge, and other leisure amenities. The ground floor will feature exclusive cafes and retail outlets facing the boulevard and directly on the Central Park. Residents will also have access to Central Park, a marina, a 4.5 kilometre Creek Boardwalk and the Retail District in Dubai Creek Harbour, featuring high-end retail and leisure attractions.